Melaleuca diosmatifolia (previously known as M. erubescens), the Rosy Honey-myrtle, is an erect shrub that reaches a height of at least five metres in our cold climate garden. The leaves are small, linear, light green and aromatic. In summer plants become covered with mauve, cylindrical flower spikes up to four centimetres long that eventually fade to white. The main flowering period extends for many weeks. Sporadic flowering will occur at other times. Flowers do not fade as quickly as other mauve-flowered species. A wide range of insects are attracted to the flowers including blue flower wasps and native beetles. Tip pruning, of juvenile plants, will help to establish dense foliage. The Rosy Honey-myrtle grows in open forest and areas subject to flooding. The species has wide distribution and is found in coastal regions, tablelands, slopes and western plains in New South Wales and southern Queensland. Melaleuca diosmatifolia is one of the best of the genus. 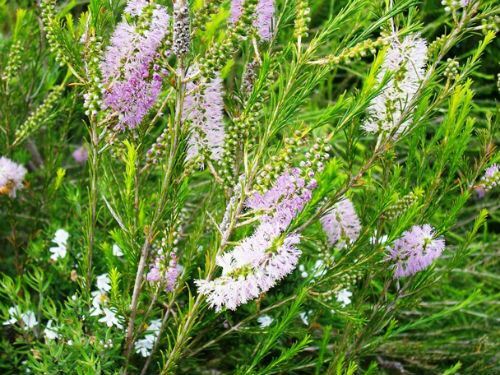 The species is hardy, free flowering and would make a colourful shrub for hiding fences. As with the majority of Melaleucas this species propagates readily from cuttings and seed.